URI should change to contain the content of the search (ideally). This means it can be bookmarked and linked to directly. A few people have brought this up lately as they put blue ocean on existing masters. Michael Neale added a comment - 2016-10-14 01:15 A few people have brought this up lately as they put blue ocean on existing masters. cc James Dumay I think this is fairly important and increasingly needed (as we were talking about). Michael Neale added a comment - 2016-10-27 06:01 cc James Dumay I think this is fairly important and increasingly needed (as we were talking about). James Dumay I believe this is now possibly the most critical thing stopping adoption, by FAR. Can we bump this up? There are existing search stuff in jenkins we can build on so the implementation of this can be rather quick. Michael Neale added a comment - 2016-11-15 22:52 James Dumay I believe this is now possibly the most critical thing stopping adoption, by FAR. Can we bump this up? 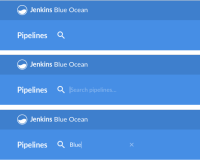 There are existing search stuff in jenkins we can build on so the implementation of this can be rather quick. Brody Maclean that zeppelin account isn't open - is there a way to open that up? otherwise we can't really use it in tickets here. Michael Neale added a comment - 2017-05-09 04:08 Brody Maclean that zeppelin account isn't open - is there a way to open that up? otherwise we can't really use it in tickets here.